Hoi Polloi has had a shop in Surbiton for nearly 20 years. For everyone of those years (and we understand for many years before that) there has been a joyous Saturday in late September when there has been a Grand Parade and street festival in Victoria Road. On a sunny day, and it is remarkable how many Saturdays in September are sunny, many thousands of residents and visitors come to central Surbiton to watch and participate in the Festival, especially shopping in the Victoria Road market and watching the eclectic carnival like atmosphere of the grand parade including the tea lady on stilts performing her tricks with her trolley and the wonderful vintage cars. Since Bob Noble started coordinating the organisation of the festival several years ago (and we understand that such organisation, like the painting of The Forth Bridge, begins as soon as the current festival ends) the festival has steadily morphed in stages from a one day event to a fortnight of full on fun and entertainment, which celebrates all that Surbiton has to offer and believe me that is a lot! Surbiton is no longer Surburbiton (it never really was). 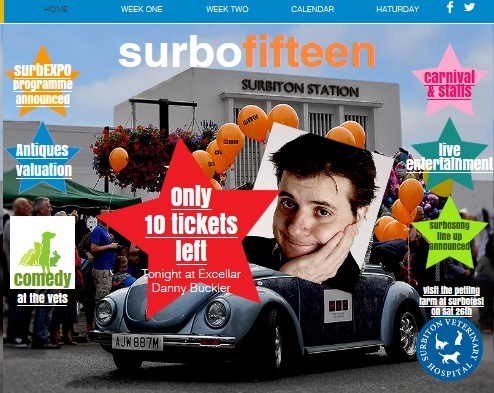 It is most definitely Superbiton thanks to organisations like The Surbiton Festival, The Farmers Market and of course the very many wonderful creative events organised by villagers of The Spirit of Seething .